Start training with the Callaway Power Platform to achieve maximum distance and consistency from every swing. Proper weight transfer, from your backswing to the follow-through, is a skill that all players must fine-tune if they wish to improve their golf game. This unique, wedge-shaped, training aid slides under your rear foot making it easy to transfer weight forward when swinging. 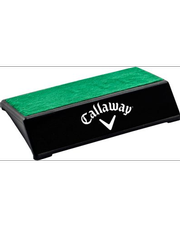 If you have any more questions about the Callaway Golf Power Platform - (Promotes proper weight Transfer); do not see the model you are looking for; need custom options; or prefer to not purchase online, then please call us at (630) 656-1291.